It's Monday and I've already located the Buy Of The Week, well should I say my fabulous Contributing Editor Joi Lindsey has found it. The Buy Of The Week is a darling romantic, 100% rayon, loose bowtie neckline, flowy short dress available in green, coral and blue. For a buzzer beater prince of $34.75. What do you think of it? Could you use this addition to your wardrobe? Contact imnotonik@gmail.com for purchasing inquiries. Being bold is a state of mind. 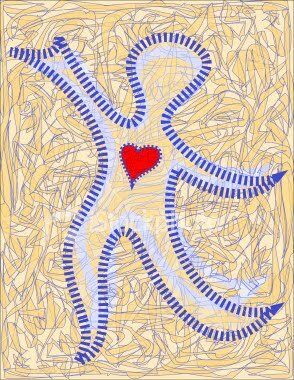 To be liberated, and uninhibited, displaying the confidence of someone not afriad to take chances and to know what one wants, is to be BOLD! The outfit pictured above is definitely a BOLD one!! The neon lime and hot pink paired together makes for a WILD yet tasteful statement. Do you agree? 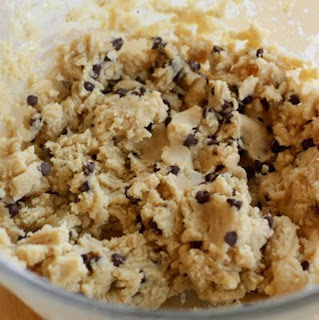 Since I like to keep my readers in the know and on top of all things Notable, I would like to share this article with you about sugar and possibly 10 things that you did not know about sugar. I found this information to be very interesting and I hope that you will too. Share these facts with your loved ones. Our health depends on it. The prep school uniform along with Ralph Lauren and Tommy Hilfiger are known for popularizing the collared shirt under a sweater look. 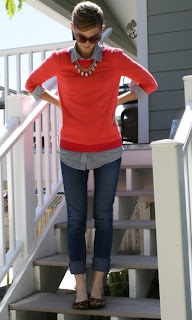 This top look can be matched with a variety of bottoms, for example skirts, shorts or slacks but today's featured looks are paired with denim, cropped jean bottoms and ballet flats. 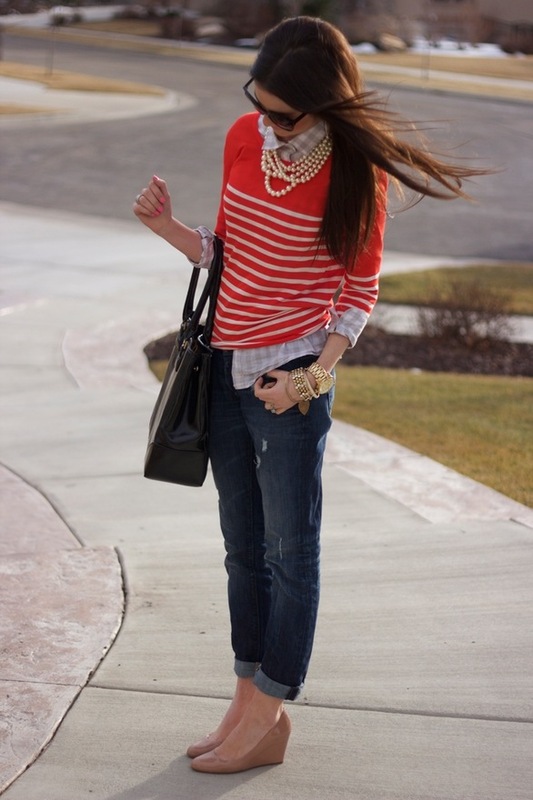 This grown up prep look adds a twist to the same old youthful prep school pairing and gives you a great casual option to shop or attend meetings at the coffee house in. Are you excited over these titillating denim-esque shoes? These platforms are distressed leather that look like denim! And they look so darn HOT! Do you agree? 5" wooden heel; 1 1/4" triple-stacked platform. 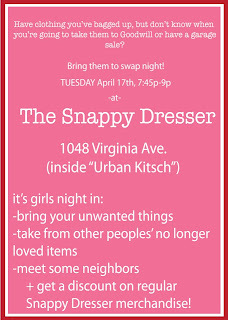 All across the nation in big cities, consignment shop owners host a swap night. This swap night motivates potential customers, current customers and fashion enthusiasts to bring in their gently used, but in good condition items to swap with other peoples items or to make discounted purchases from the stores inventory. 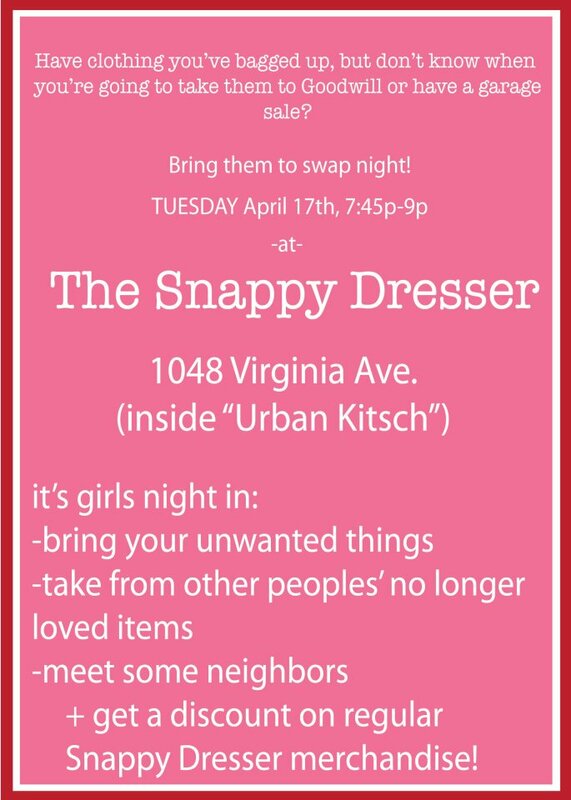 Snappy Dresser is joining the best in the best of Indy boutiques by hosting their Swap Night #2 - April Edition on Tuesday, April 17th. The event will occur from 7:45pm - 9:00pm at the Snappy Dresser located on 1048 Virgina Ave. Indianapolis, IN. For more information view the posted flyer and follow the facebook event link above. Go through your wardrobes and closets and pull out some of the things that you no longer want or need. This item could be what someone else is looking for. Why not use fashion to save the world??? Swapping is all about recycling. Go Green! I hope that you enjoy, this should be a fun time! The Top 10 Workout Songs For April by Run Hundred!!! This month in the gym, radio hits ruled. Nicki Minaj, Katy Perry, and Madonna all released singles destined for workout playlist glory. But, it's not just pop divas who prevailed. Carrie Underwood's latest retains a few country touches. Skrillex and Sirah cranked out a boisterous dubstep anthem. And, although most hip-hop is too slow to make the cut, J. Cole's aptly-titled "Work Out" proved to be an exception. Here's the full list, according to votes placed at Run Hundred--the web's most popular workout music site. I have received many emails asking about the Spring Ahead fashion series and what I would be discussing next. 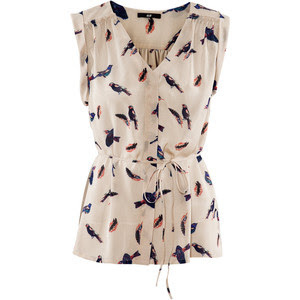 Well today's the day for Spring Ahead 2: Shop for Tops. The first post was giving you my editor's choice of Spring pants for $25 and under. 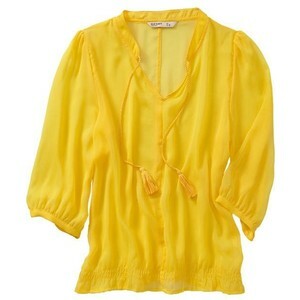 The Spring colored and lightweight tops that are included in this post are on trend and very stylish. To purchase any of the items that you see listed contact me at imnotonik@gmail.com. 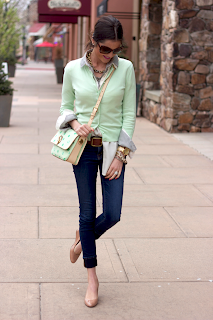 Mint long-line chiffon pussybow blouse. 100% Polyester. Machine washable. 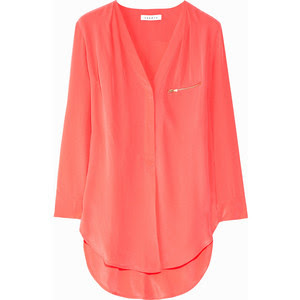 Coral silk. Pleats, zip-fastening breast pocket, concealed snap-fastening placket, concealed snap-fastening cuffs. Slips on. 100% silk. Hand wash. Designer color: Bonbon. 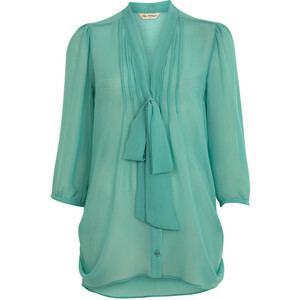 Straight-style crêpe blouse with concealed fasteners at the front, gathers at the shoulders and back, sewn-in turnups at the armholes and a narrow tie belt. Details 100% polyester. 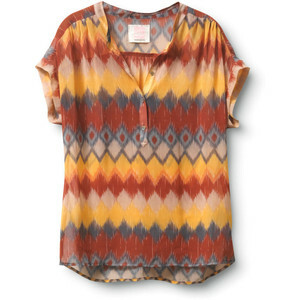 A blouse that's sun-soaked in vivid color, but so airy in poly georgette, it will catch the slightest hint of breeze. Detailed with shirring at the shoulders and a slender button placket. Loose, easy fit. 26-inch length. 100% polyester. Hand wash. Imported. I hope that these selections help you Spring Ahead into your Spring wardrobe. REMINDER: Like the Notable Styles page on facebook at http://www.facebook.com/notablestyles That will allow the updates to populate right into your News Feed! !